To be perfectly honest I think somewhere deep within I have this instant defiance when it comes to a hyped product, I don't want to love it as then I'll just be like everyone else but when the Revlon ColorBurst Lip Butters were launched in the UK I happily placed my order for two of them straight away to see what all of the fuss was about. The Lip Butters are a hybrid between a lipstick and a lip balm. Originally I ordered Strawberry Shortcake which is a baby pink and Tutti Frutti which is an orange but questioned later why I ordered an orange as I thought I'd never wear it...! Strawberry Shortcake however was very much like MAC's Viva Glam Gaga lipstick so I was delighted as that was limited edition. Anyway the long and short of it is I'm not going to lie, although I loved the pink they did just get put in my drawer and used only occasionally but I put this down to the fact that I often don't wear anything on my lips and if I do I'll just put it on once when I apply my make up and that's it. Fast forward to just the average trip to Boots for a mooch and I spotted the Revlon Lip Butter in 'Sorbet' at the top of the stand with the new release products for summer. With it's gorgeous hot pink tones I knew I had to have it so I did a quick test on my hand and silently declared that it was mine. The bottom line is... this shade is gorgeous. Your lips feel soft and look great whilst wearing it. I wouldn't say that they last a crazy amount of time on your lips but what I do is apply a similar lip stain like Revlon Just Bitten Kissable Balm Stain in 'Lovesick' and then this on top so that the colour is left behind. I think the thing I love the best about them is they're a lip product that doesn't always need a mirror so you can carry them around with you and re-apply quite happily. I love this! 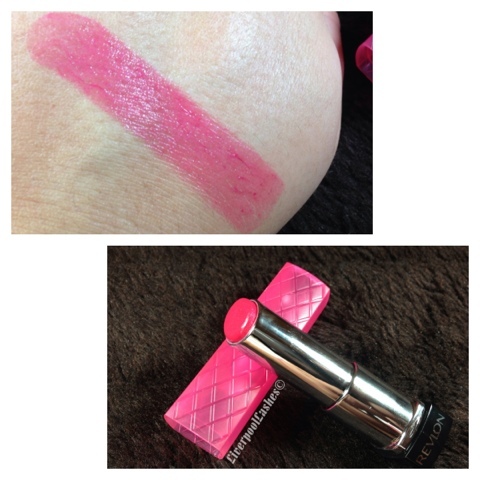 I have shade Lollipop which is a vibrant pink and I wear it all of the time!